Amidst these dark times we live in, the 2019 Range Rover SV Coupe was a spot of bright light. But rather than grace our unworthy salt-and-pothole riddled roads with its greatness, it will spend the rest of its existence in our minds only, for its been canceled ahead of production. A light has been snuffed out; we are all plunged into eternal darkness. Unveiled barely a year ago at last year’s Geneva Motor Show, it was a fantastic two-door SUV with a 557-horsepower supercharged V8 and a $295,000 price tag. Expensive? Absolutely. But some nutter somewhere would have bought it. And before any of them were even delivered, Land Rover went ahead and just decided not to produce any of them, reports Auto Express. 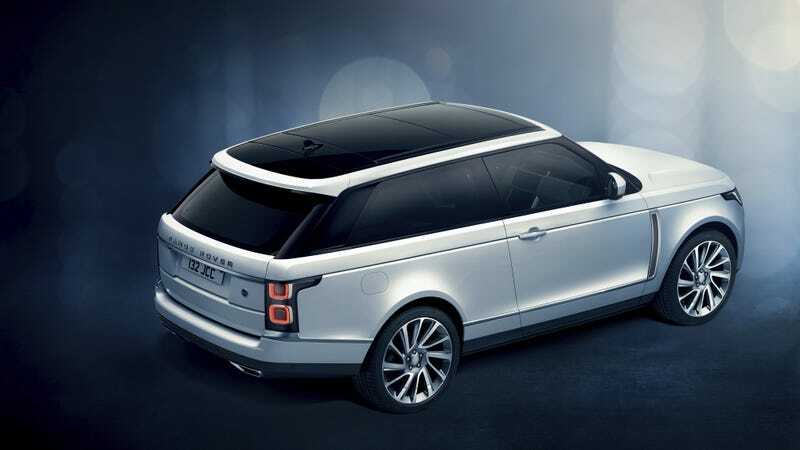 “We have taken the difficult decision to inform our customers that the Range Rover SV Coupe will not proceed into production. Instead, Land Rover is focusing its resources and investment on the next generation of world-class products,” a spokesperson confirmed to Car and Driver. Folks, this is a dark day indeed. How often do we rage at the stars that our market has become far too saturated by lumbering SUVs that are all basically the same car? Land Rover’s answer to that was to simply chop off the rear doors on one of its more bonkers models. It was genius. It would have been a joy to bring the SV Coupe into our reality. Can you even die when you never really existed?